Before you can start recording your video soundtrack you need to have a means of recording the audio. Many video cameras have an external microphone socket, so in this instance you can plug in a lapel microphone and record audio straight to your camera. However, it does mean you are fixed to the spot with a cable running to your camera. In this scenario, people often consider getting a wireless microphone in order to move independently of the camera. I would not recommend this as lower cost wireless sets produce a poor quality recording and there is a better way. These are recorders that record digitally to a storage medium, usually an SD or mini SD Card. In recent years some very professional yet affordable devices have become available. I am going to recommend based on the one I use. My device of choice is the Zoom H4n digital recorder, but there is also something called the Zoom H1, which I would also suggest. 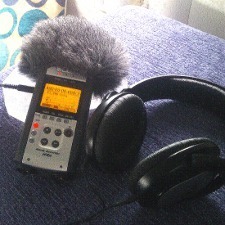 The H4n is basically a more functional version of the H1. Whether you need the extra functions depends on what your requirements are. The H4n does everything that the H1 does, however, the main difference is that the H4n has two professional XLR microphone inputs. This is useful if you want to record two studio microphones simultaneously, such as the C1000 and M3. If this is not what you intend to do, for example if you just want to record your lapel mic then the H1 would be ideal. In addition, both of these devices have a pair of high quality built-in mics, which means you can also use them with their built in microphones in a close mic’d setup.